Looking fine, I like the rusty aesthetics. Concerning the Venture, I would change its flight deck to a (borer-) drone bay and up its logistic stats a bit. Like a super Shepherd. And a random thought: This last picture made me think that it would help a lot to sale the scale of fighters if bombs would drop (i.e. get smaller) when over a capital target before they explode. another ship? this looks like it would be fun customizing it. also, that old, broken down and patched up look is great. and by the gods, that painting process takes long. but it was helpful reading it down. i think it's a shame it didn't end up with composite mounts, they seem like a great fit for this ship. i'd actually like to see more of these special mounts in general. there are so many things that differentiate ships from each other in this game, i really don't see adding some more flexibility in what weapons can be mounted as something negative. and having to choose not just between different weapons of one type, but also between different types makes coming up with new loadouts more interesting, imo. modders seem to like making frequent use of the special mounts, and in my experience it usually works out very well. i can't quite decide whether i like the idea of it having Damper Field. on the one hand, i do like the idea of a slow but really tough carrier that's supposed to fight at the front lines. but on the other hand 1) Damper Field is already really strong on frigates, putting it on a well armored cruiser seems kinda crazy, and 2) a major part of Damper Field is supposed to be its drawback of disabling all weapons while active. since the primary power of this ship comes from its flight decks, that doesn't seem like a particularly good fit. regardless, i'm still very much looking forward to trying this thing myself, great job as always! also, i think i found a small error in the blog post: example 3 of Lines, Shapes, and Form says "darker on the left, lighter on a right", which seems to be the wrong way round. Sweet, sweet work. Love the ship and the writing. The technical aspect of this blog post is definitely going to be useful if/when I get back into the modding groove! So, thank you for taking the time to painstakingly write it all out. I'm sure writing a 1/2 of War & Peace can be a little draining at times. I like it, apart from the displeasing idea of having two asymmetric swerving turrets, one missile and one ballistic. On the other hand, missile turrets are cool and should be more plentiful, since annihilator pods are really strong. Three flight decks now but that's very open to change, as noted. In the latest iteration both turrets are missiles so you're all clear for annihilator spam. i'm thinking three flight decks, two medium turrets, a whole bunch of small turrets, and great toughness is too much for a cruiser, particular one that has a bit of a troubled past with conversions back and forth. i suppose it could be classified as heavy cruiser carrier, but then the sprite seems a bit too small. You need to bear in mind that it has horrible flux stats, very low OP and will probably have poor out-of-combat stats as well. Get the whole picture before ya talk about balance! Remember the Scarab. 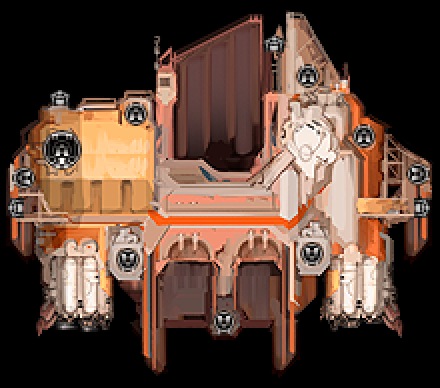 It has many mounts for a frigate, but has difficulty filling all of them even with max OP. Also, their arcs do not overlap very well, much like Centurion. This new Mora could be like the Scarab in that way. And, yes, 5000 base flux is hideously low for a cruiser (and I probably would want at least 5 capacitors, which I do for the Heron). Mora probably will not overpower much by itself. you got a point with the low OP, but poor flux stats don't matter much (relative to other ships', that is) when its power mainly comes from flight decks, missiles and heavy armor. The Mora could perform quite well should the player somehow condescend to flagship one over another cruiser (which wouldnt be for very long, I imagine) but in AI hands the extremely low flux cap wont matter that much given the ship can "rest" in damper field, making the ship deceptively strong from what I can theorize. Very nice! I especially liked the discussions on the art skills - I've never had any training beyond the elementary school level, so its all really cool to me. Me too so much! Give the Hammerhead back its 6 hangar points so I can launch a broadsword wing from it again!